The Conference of Ibero-American Audiovisual and Cinematographic Authorities (CAACI) is an international agency for the Ibero-American region, specializing in audiovisual and cinematographic production. The aim of the CAACI is the development of the cinematographic field within the audiovisual sphere of the Ibero-American countries, and integration through an equitable participation in regional cinematographic activity. On the other hand, the association of the European Film Agency Directors (EFADs) brings together the Directors of European Film Agencies in 31 countries in Europe (EU, Iceland, Norway and Switzerland). The EFADs helps to ensure policy support for audiovisual and cinematographic creation in Europe and the effective distribution of European works across Europe and internationally. In the final statement of the EFADs-CAACI meeting held in Toulouse on March 2016, one of the proposals was the launch of a jointly funded co-development grant in order to encourage collaboration at an earlier stage , increase the number of genuine artistic co-productions and to build a structured partnership between Europe and Latin-America. It was agreed that this grant should be awarded in the framework of some major festivals’ professional fora. Considering that the San Sebastian Festival is one of the biggest film events in Europe and that its Industry Club already acts as a hub between our two continents by organizing the Europe-Latin America Co-Production Forum, it seems the perfect place to introduce the EFADs-CAACI Europe-Latin America Co-Production Grant. Consequently, the EFADs-CAACI Europe-Latin America Co-Production Grant will be awarded in the framework of the 6th Europe-Latin America Co-Production Forum taking place on 24, 25, 26 and 27 September 2017 during the 65th San Sebastian Film Festival. The EFADs-CAACI Europe-Latin America Co-Production Grant will be awarded by an international jury to one of the projects selected in the VI Europe-Latin America Co-Production Forum. 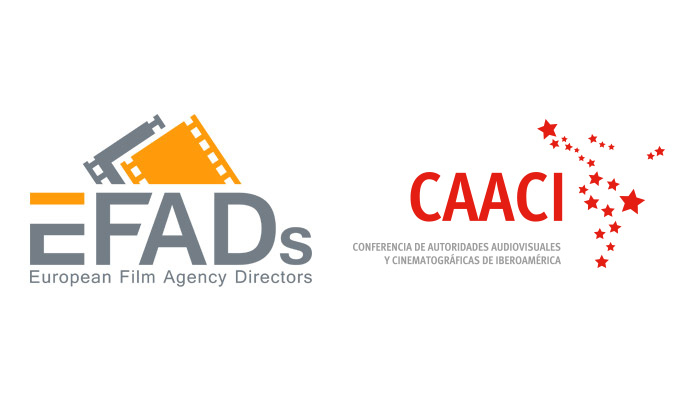 The EFADs-CAACI Europe-Latin America Co-Production Grant aims to make a contribution to the cooperation between Europe and Latin-America in the field of the film industry. This contribution takes the form of a co-production grant, awarded under the following conditions. The EFADs-CAACI Co-Production Grant is open to projects that have been selected to participate in the VI Europe-Latin America Co-Production Forum. The EFADs-CAACI Co-Production Grant is aimed at supporting development costs of the selected project. The project must be designed to be a co-production involving at least one European and one Latin American country. Special attention will be paid to projects designed to be a coproduction between “new” co-production partners, that is to say, partners from countries from Europe and Latin America that do not usually cooperate . with Europe when it is a project submitted by a Latin-American producer. This connection may be based on any relevant element: cultural content of the script, foreseen shooting locations, cast or crew, etc. The logos will be available on the official websites of these Organizations. The EFADs-CAACI Europe-Latin America Co-Production Grant will be awarded by an ad hoc jury composed of one representative of CAACI, one representative of the EFADs and one representative designated by the San Sebastian Film Festival. The decision taken by the jury will be final. The EFADs-CAACI Europe-Latin America Co-Production Grant award will be announced on the 27th of September 2017 at an event organized in the frame of the VI Europe-Latin America Co-production Forum. The amount of the EFADs-CAACI Europe-Latin America Co-Production Grant is EUR 20,000. The amount actually received may vary due to banking costs, which could be deducted. 50% after submission of a co-production contract only and not before the period of three months following the first payment. The EFADs-CAACI Europe-Latin America Co-Production Grant carrying EUR 20,000 gross will be handed over either as a bank cheque, as an international cheque, or as a bank transfer to the majority producer of the winning project. It will only be paid in euros. In order to comply with European State aid rules, the amount of the grant coming from European authorities will be considered as de minimis aid*. The beneficiary will have to fulfil a statement of de minimis aid received. All doubts arising from the interpretation of these rules and regulations will be solved by EFADs and CAACI jointly.